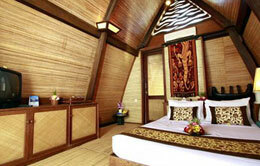 Hotel Villa Ombak, the four stars hotel and the first accommodation which built on Gili Trawangan. 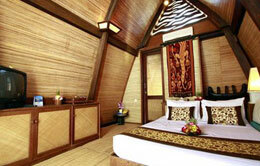 Gili Trawangan is the biggest Island on Lombok that offer many accommodation inside. Gili Trawangan is the part of district from North Lombok (Lombok Utara), the island kissed by the sun, with a cloak of beautiful beaches and surrounded by pristine azure waters thriving with an abundance of stunning marine life. The large semi-open bathroom at the backside can be accessed from the bedroom via a staircase (from an opening in the floor of the bedroom) or from the downstairs living area. There are also bungalow rooms, which are half houses. Easy way to reach Hotel Villa Ombak is by fast boats. 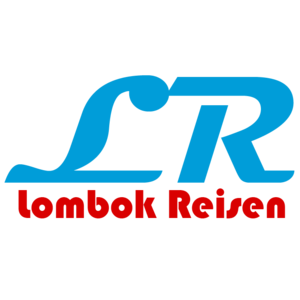 Most of the fast boats transfer from Bali to Gili Trawangan and than Lombok. There are many fast boats to Gili such as: Gili Cat, Black Pearl, Bluewater Express, Eka Jaya, Narooma-Getaway, Mahi Mahi and the new comer fast boat Ocean Star Express. For the easier, Please book by Bluewater Express, Gili Cat or Ocean Star Express cause those three Fast boats that support villa ombak directly. 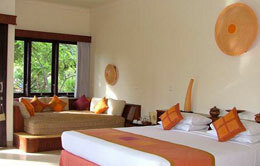 The other option to get Villa ombak on Gili Trawangan is by flight from Bali to Lombok. You will drive around a hour from airport to the harbour of Villa Ombak and transfer by speed boat aroun 15 minutes. (from the whole August and from 20th December to 5th January), Cancellation Fee will be charged on cancellation received by us 14 days prior to arrival date and for cancellation received less than 14 days prior to arrival, or in the event of no show, 1 (one) night room charge plus applicable 21% for government tax & service charge will be applied. Daily Breakfast for 2 people only, if more than 2 people, additional charge shall be applied accordingly. Of 21% for Government tax & service charge. Occupancy of Rooms: No Charge for 1 kid under 12 years old sharing bed with parent. 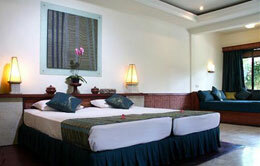 If an extra bed needed, there will be additional charge of USD 25 net / pax /day.